New video by north west London rapper Da Flyy Hooligan, “Romero Bryan” is taken from his EP “Fucc Ya Life Praise Mine” released earlier this summer. Long regarded as one of the UK’s most gifted and creative lyricists, his bullish rhymes are fuelled by Agor’s lavish guitar driven production. The newly shot visuals are equally as impressive, filmed and co:directed on location by DFH and Ringz ov Saturn, with further drone sequences choreographed by Subtle Satori. In an extremely rare occurrence for a British rap artist, DFH has signed with a US label, 22 Entertainment, for the release his new album “S.C.U.M.”. Out on October 28th 2017 and produced entirely by Agor, it includes features by Westide Gunn and Hus Kingpin. The label, whose back catalogue includes Royce da 5’9″, Joe Budden, Fashawn, Stat Quo, Crooked I, and J-Kwon, are distributed worldwide by Sony’s The Orchard, and the new album will be available in both digital and physical formats. The new album “Black Beach” by Detroit rapper ZotheJerk and NY State producer (now resident in Winnipeg) Frost Gamble released today, Friday May 26th through 22 Entertainment. Zo’s powerful social commentary on the experience of today’s “Black America” is complimented by Frost’s production, infused with a mixture of soul, electronica and straight hip hop bangers further enhanced by the contributions of featured artists including KXNG Crooked, Sadat X, Guilty Simpson and Boldy James. Cincinnati’s rising hip hop star Buggs tha Rocka has had a busy past few months. He has also just been featured in the new Issue 40 of American multi genre printed publication Ghettoblaster Magazine which is hitting shelves now in the USA and Canada. 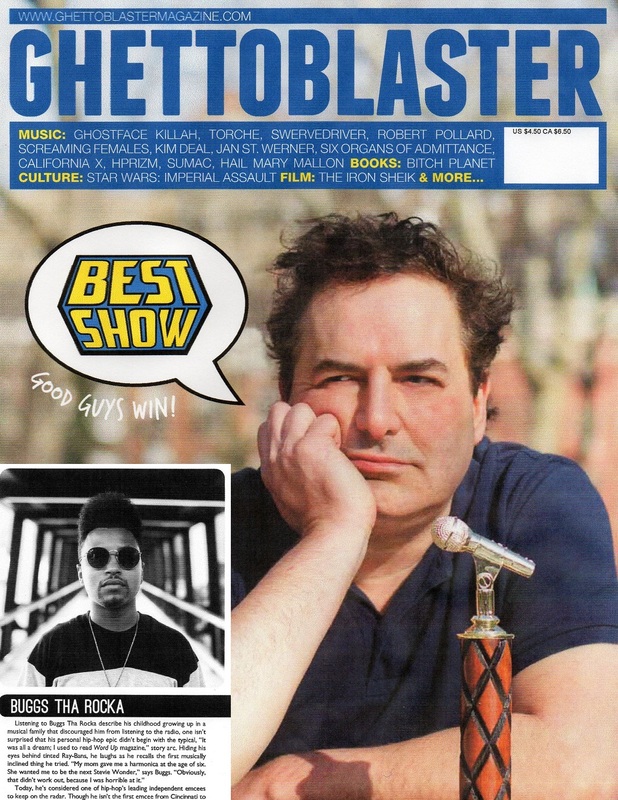 Other features in this issue include Joey Bada$$, Ras Kass & Apollo Brown, Ghostface Killah, Torche, Swervedriver and many more. Buggs tha Rocka will also be returning to Austin Texas later this month to perform at the SXSW Festival for the third consecutive year. To get a feel for his live show, check out these visuals taken in October last year at Cincinnati’s Rhinegeist Brewery for the Resurrection of Hip Hop II event which included performances by many of the city’s upcoming local artists, sets by Clockwork DJ & DJ Ghost, Buggs tha Rocka and the re-formed pairing of Hi Tek and Talib Kweli, aka Reflection Eternal.